This classically-styled lamp is a perfect addition to any decor, whether in a residential and/or commercial spaces. With a gorgeous combination of a white base and brushed nickel finish, as well as a white fabric shade, this fixture possesses a creamy-like colour that is, both, soothing and visually appealing. Can be used as a table and/or night light. Lighting is about so much more than seeing what's around you and Globe Electric's 22In Vera Table Lamp is a prefect example of that. The square glossy white base reflects light splendidly to provide a soft ambient glow. Accented with a gold circle cutout and a gold neck, this lamp brings a timeless elegance into the modern world. The white and gold color palette accents any interior design and creates a visual masterpiece for your room. The 5-foot cord allows you versatility of placement so you never have to worry about where your outlets are located. Perfect for living rooms, bedrooms and offices alike, you can place the Vera Table Lamp anywhere throughout your home. Add a Globe Electric LED bulb to save in energy costs. Requires one 60-watt max medium base/E26 bulb (sold separately). 27.5-inch Ceramic Table Lamp in White with White Fabric Shade This classically-styled lamp is a perfect addition to any decor, whether in a residential and/or commercial spaces. With a gorgeous combination of a white base and brushed nickel finish, as well as a white fabric shade, this fixture possesses a creamy-like colour that is, both, soothing and visually appealing. Can be used as a table and/or night light. 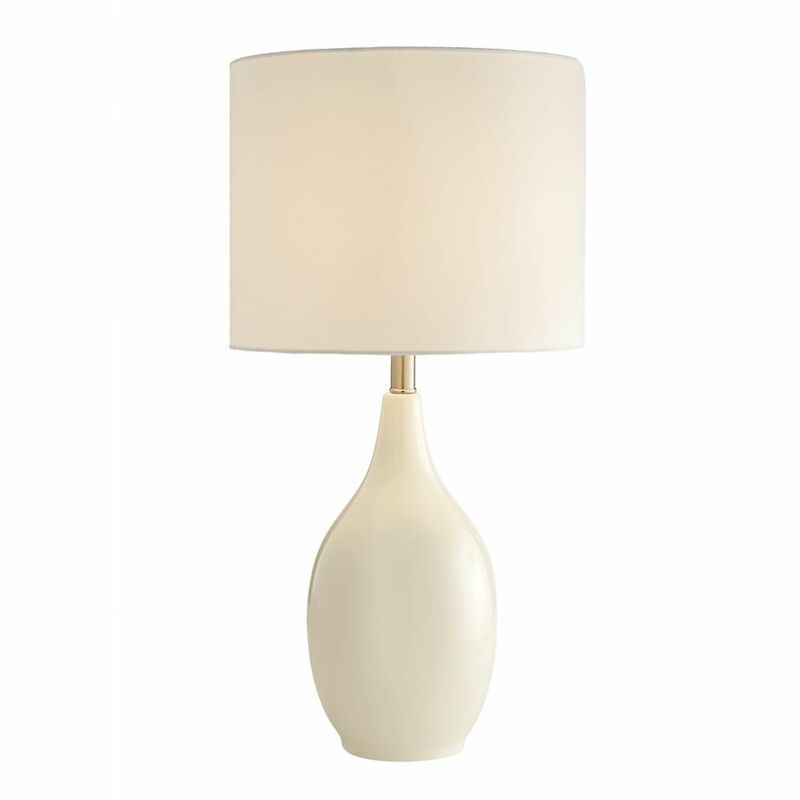 27.5-inch Ceramic Table Lamp in White with White Fabric Shade is rated 5.0 out of 5 by 1. Rated 5 out of 5 by Jules82 from Nice lamps Bought these a month ago and they were a great choice. They have a nice ivory white base and white shade.